Ruffled Hot Mat - Inst. Materials: Worsted Weight Cotton Yarn. Peaches & Crème, about 2 ounces. I used variegated for both sides of this mat; and a G hook. 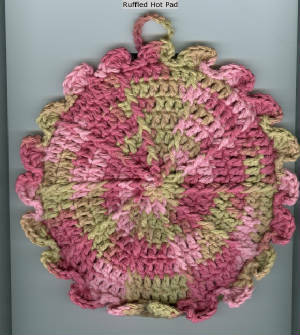 Finished Size: The surface inside the ruffles of the Mat holds a six inch dish. The double thickness is joined so that the outside ruffles stand-up and make a rim around the dish. FRONT: Chain 3, join with a sl st to form a ring. Rnd 1: Ch 3, work 9 dc in the ring. Join with a sl st to the top of the first ch-3. (10 dc total). Rnd 2: Ch 3, FPDC around the post of the dc directly below, (dc in the next dc, FPDC around the post of the same dc) around. Join with a sl st in the top of the 1st ch-3. (20 sts). Rnd 9: Ch 1, sc in the same dc, sl st in FLO in the next 4 dc, ch 3, work 5 more dc in the FLO of the same dc (5 total dc). (Sl st in the next 4 dc, ch 3, work 4 more dc in the same dc) around. Join with a sl st to the 1st sc. Finish off and weave in ends. BACK: Use the same color as for the Front or a contrasting color. Rnd 1: Ch 3, join to form a ring. Work 11 dc in the ring. Join with a sl st in the 1st ch-3 made. (12 dc total). Rnd 2: Ch 3, work 2 dc in each dc around. Join as before. Rnd 3: Ch 3, dc in the same dc, (dc in the next dc, 2 dc in the next dc) around. Join as before. Rnd 4: Ch 3, dc in the same dc, (dc in the next 2 dc, 2 dc in the next dc) around. Join as before. Rnd 5: Ch 3, dc in the same dc, (dc in the next 3 dc, 2 dc in the next dc) around. Join as before. Rnd 6: Ch 3, dc in the same dc, (dc in the next 4 dc, 2 dc in the next dc) around. Join as before. Rnd 7: Ch 3, dc in the same dc, (dc in the next 5 dc, 2 dc in the next dc) around. Join as before. Rnd 8: Ch 3, dc in the same dc, (dc in the next 6 dc, 2 dc in the next dc) around. Join as before. Finish off and weave in ends. Rnd 9: With Wrong sides together, and holding with the front facing you, join with a sl st in any st. Working through both thicknesses, ch 1, sc in the same st, (sc in the back loops only of each front and into the corresponding loop of the back piece) around. Join with sl st in the first sc. Finish off and weave in all ends. If you would like a Hanging Loop: In any stitch on round 9, chain 14, sl st in the same st and continue with pattern. This pattern is the copyright of Joyce A. Hodnett, 2004. You may print out as many patterns as you like for your own personal use. For any other use, please email me first.